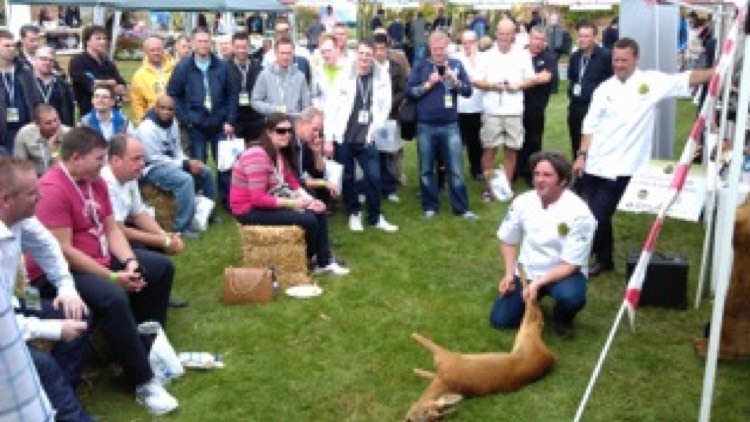 As promised in my last Blog I thought I would go into a bit more detail about the butchery course we watched at the cookery and food festival recently. The purpose of writing this is to make us aware of the butchery process and to remind me not to over order or waste meat. Most of us live busy lives and buy our meat in packs from the supermarket, and if we’re lucky we can buy it from our local butcher. We can become distant from the fact this is a real creature. I am a great believer that if a creature’s life was taken for my food then the very least I can do is respect that and make sure I don’t waste anything. I was relieved to see the butchery was carried out respectfully and professionally and not a single part of the creature was wasted. After witnessing the process first hand I appreciate what it means to eat meat even more. It definitely would help if more of us meat eaters did the same. It’s arguable that if we do not add these nutritious foods to our diet then we will lose a lot of this wildlife from our countryside, because if there’s no demand for it, then there is no need to keep it. Watching the butchers at work might have turned the sensitive amongst us to vegetarians, but for someone like me who can’t resist a bacon sandwich, it has definitely reminded me to take closer notice of where my meat comes from. Just a little aside, I read recently that sales are up of cookery books that cover the chopping and curing of meat as well as its preparation for the table. I don’t know if it’s because home butchery can cut costs in a recession or if it’s the influence of chefs like Hugh Fearnley-Whittingstall and Jamie Oliver. Next time you buy meat just take a moment to make sure you are buying the right amount. Don’t be wasteful. If you can afford to then please buy free range so that there has been some quality of life for the animal too. Above all cook it well and enjoy the bounty. If you’re not sure about how to cook something or want a recipe, just ask!